Hey everyone! 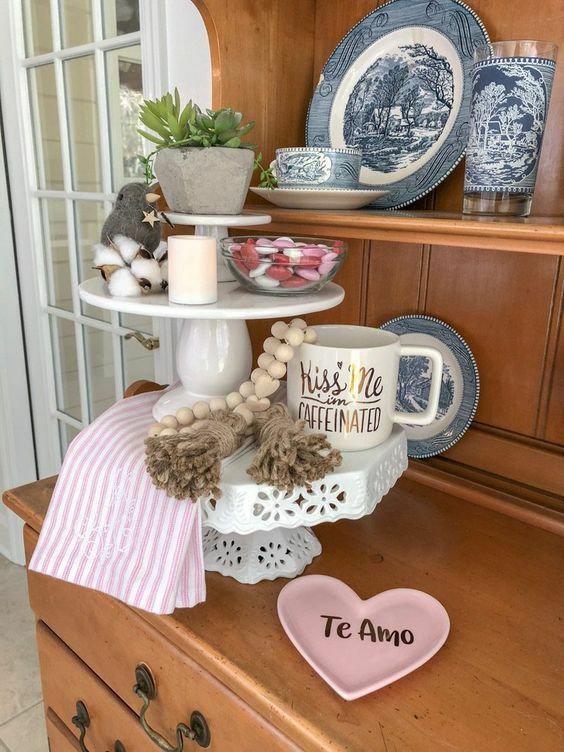 I have been having so much fun with my two tiered tray and today I wanted to share how I decorated it for Valentine’s Day. 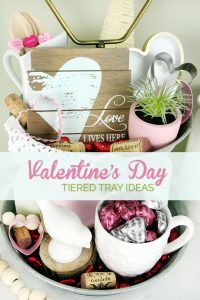 AND… if you scroll to the bottom of the post I’m sharing some other Valentine’s Day tiered trays that inspired me. Whenever I’m shopping for my tiered tray, I enjoy visiting multiple stores to find various ‘small items’ that will fit into the tray nicely. You truly can’t find everything at one store if you want a nice variety in your tray. 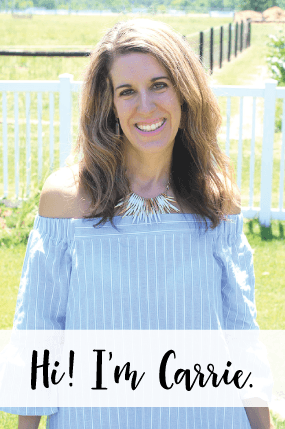 I usually shop at Hobby Lobby, HomeGoods, TJMaxx and the Target Dollar Spot. I also shop my own home and reuse items from season to season in my tray. 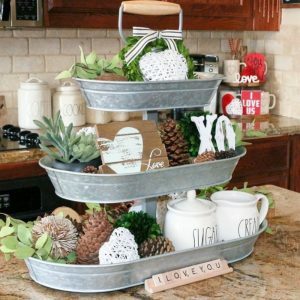 As Kellyann from This Blonde’s Shopping Bag has said, these tiered trays can get expensive when you start decorating them for each season! Ha! Especially if you have more than one tray in your home. Once I’ve had this tray for a year, I plan to reuse everything from season to season and maybe just change out one or two items to change it up a little. I found most of my items from the Target Dollar Spot this time, they had a TON of small Valentine’s Day items. I filled the coffee mug with Valentine candies and used wine corks and little miniature red hearts as a filler on the base. 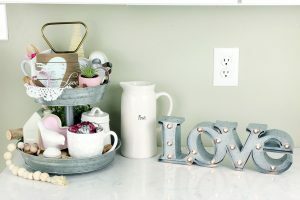 I really enjoy neutrals in my home, but wanted to add some of the ‘traditional’ Valentine’s Day colors… I decided to go mostly with whites and pinks (more of a blush pink) and I’m really happy with the end result. 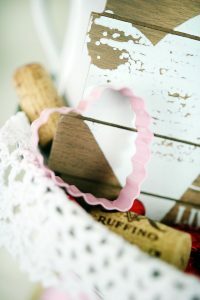 I found this mini palette sign at Hobby Lobby and this pink heart shaped cookie cutter is from the Target Dollar Spot. I enjoy layering neutrals with a little pop of color (the pink) and I enjoy mixing different textures and metallics. This creamer pitcher has been on my tray since the beginning and I used these wooden spoons when I had my tray decked out for Christmas. 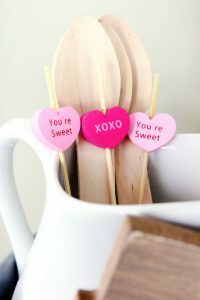 I decided to add these Valentine candy heart stirrers that I found at HomeGoods. I really love that I added wine corks to the base of the tray. The texture from the corks and the pop of color the stained edge adds is really fun. Plus, I love wine… so, it’s perfect! 🙂 This little miniature plant is from the Target Dollar Spot. I found this white ceramic bird from the Target Dollar Spot and I placed it on top of a mini wood slice. 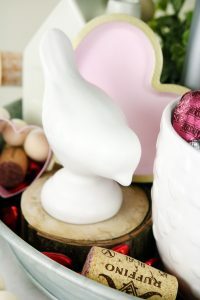 You’ll see a wooden heart in pink and gold behind the bird and it is a ring holder that I found in the Target Dollar Spot. I knew it’d be a perfect ‘filler’ prop for my tiered tray if placed on its side. 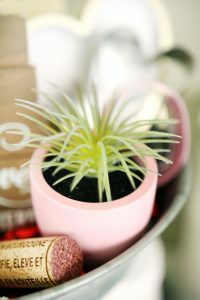 I used one of my ceramic houses as a filler near the back of the tray and a small potted plant. I always include a coffee mug at the front of my tray and this time I filled it with some heart shaped chocolates. 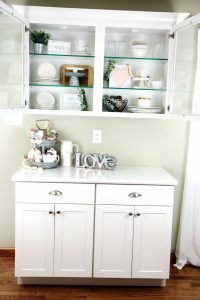 I have my two tiered tray on the serving area in my kitchen, which is a perfect spot for it! I found the metallic ‘Love’ sign that lights up from Hobby Lobby. I really enjoy little items in my home in the main living area that I can light up in the evening and make the space really cozy. 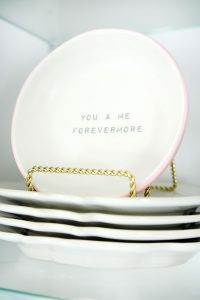 I won’t go over how I decorated the open shelves, but I did find this adorable plate with a pink bottom in the Target Dollar Spot. I added little bits of pinks to these shelves to go along with the whites and pinks in the two tiered tray. 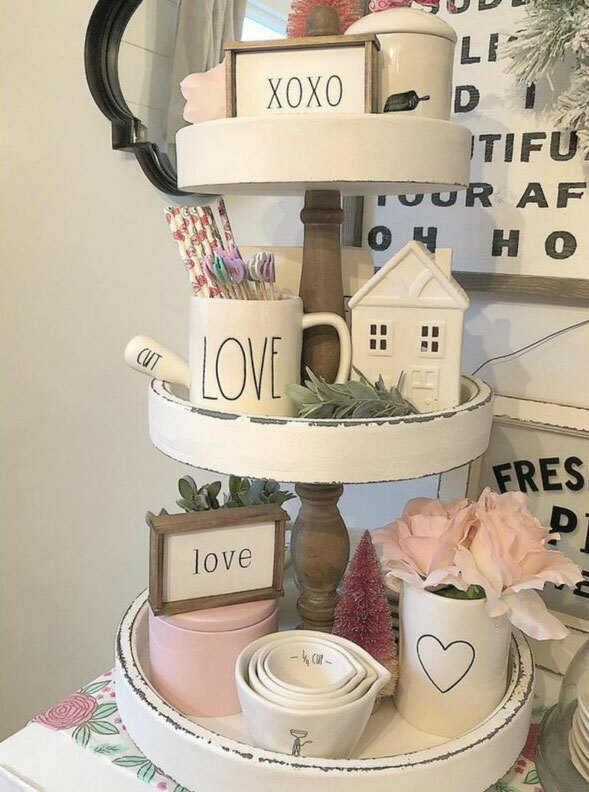 What I loved about this tray is the whites and pinks, the wood framing on the ‘Love’ and ‘XOXO’ signs, the ceramic house and the pink bottle brush tree. 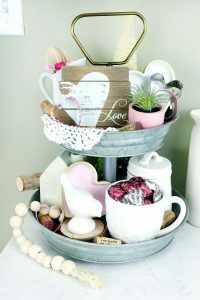 This tiered tray has the same heart/love palette sign that I found at Hobby Lobby and I just love all of the natural greens added to it. The oversized wooden beaded tassel garland adds a nice punch to this tray. I like that the tray is really just a few different sized cake stands. The tea towel looks great on the bottom tray. 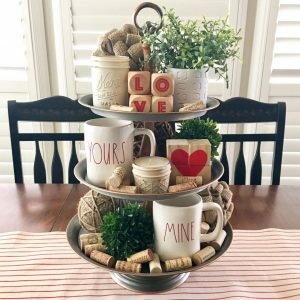 This tiered tray gave me the idea to add the wine corks as fillers for the base. I hope I’ve inspired you with all of these tiered trays! And, now that I have my tray decorated for Valentine’s Day, I can enjoy it for… a month? Before it is time to decorate it for the Spring! Ha, ha! I know, I’m crazy!!! Lol! But, it’s fun!!! Have a good day everyone!